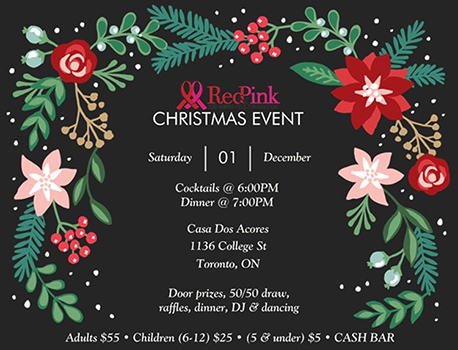 Red Meets Pink and its volunteers are very excited to invite you, your family & friends to our Christmas fundraising event which will be held on Saturday December 1, 2018. Christmas is a family celebration and for the past several years, each one of you have become a member of Red Meets Pink’s family and we want to celebrate this event with all of you. And this year we are celebrating 15 years of making a difference & to show a little token of appreciation, this year water, pop, juice, and coffee is on us. Come out and join us for these two great causes that Red Meets Pink represents, Cancer & Aids. Enjoy great food, entertainment and raffle prizes. The best part of it all is the great feeling of being together and knowing that we are all making a difference in supporting these two great causes. Santa Claus & Mrs. Claus will be there & he will be giving out presents to the kids. If at all possible, we ask if you could bring an unwrapped toy for boys or girls, from ages 1 month to 16 years of age, we would greatly appreciate it. In order for us to properly plan the quantity of food & beverages required for our event, all tickets must be purchased and paid for in advance by no later than November 23/18. Please note that because this event is being catered, we will need to have an exact count and no walk-ins will be allowed. Please purchase your tickets in advance before the deadline. Please make cheques payable to Red Meets Pink Foundation.